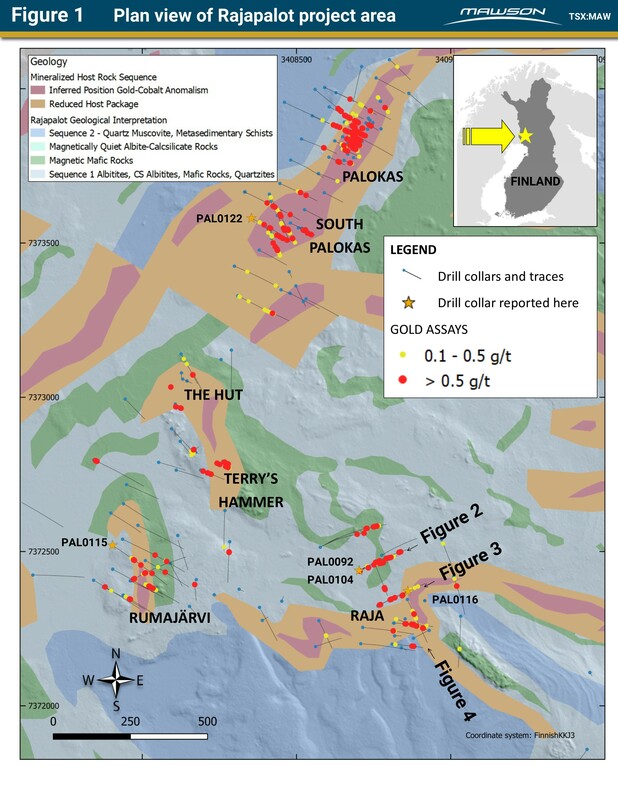 Vancouver, Canada — Mawson Resources Limited (“Mawson”) or (the “Company”) (TSX: MAW) (Frankfurt: MXR) (PINKSHEETS: MWSNF) announces results from five new drill holes at the Company’s 100% owned Rajapalot gold-cobalt project in Northern Finland. Holes are reported from three prospect areas and all intersected gold mineralization. 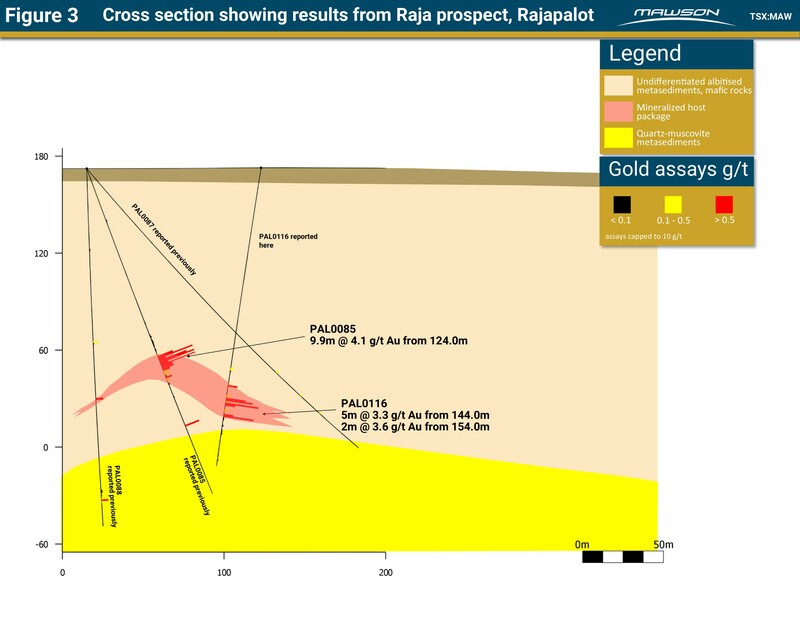 This release provides results from 5 drill holes: PAL0092 (Raja), PAL0104 (Raja), PAL0115 (Rumajärvi), PAL0116 (Raja) and PAL0122 (South Palokas).Drill holes not reported above (PAL0104, PAL0115 and PAL0122) also intersected anomalous gold mineralization and assay results are provided in Tables 2 and 3. 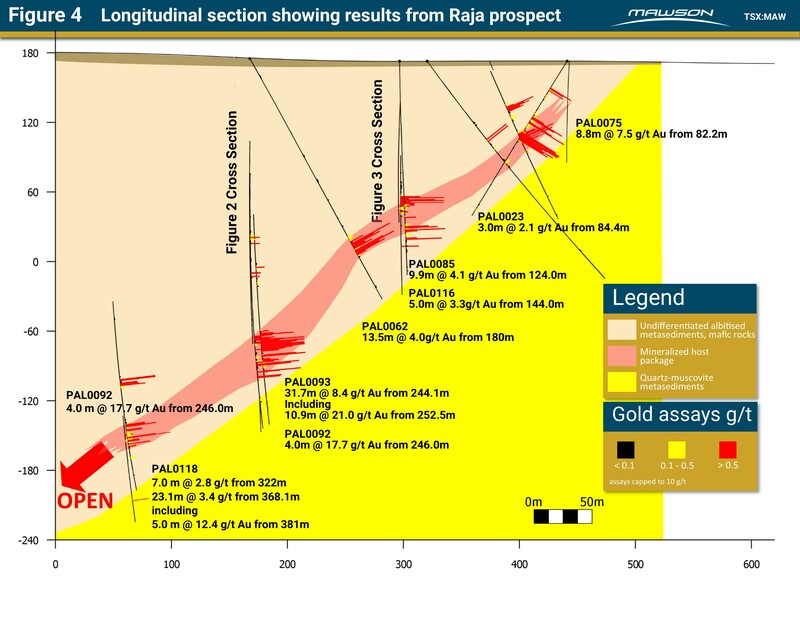 A plan view of the drill results and named prospects is provided in Figure 1. Cross and long section views and a prospect plan are included as Figures 2–4. Tables 1–3 include all relevant collar and assay information. Assuming a predominant stratabound control, true thickness of the mineralized interval is interpreted to be approximately 90% of the sampled thickness. Intersections are reported with a lower cut of 0.5 g/t gold over 1 metre lower cut, no upper cut-off was applied. Five diamond drill rigs from the Arctic Drilling Company OY (“ADC”), Oy Kati Ab (“Kati”) and MK Core Drilling OY (“MK”), all with water recirculation and drill cuttings collection systems were used for the drill program. Core diameter is NQ2 (50.7 mm) or WL76 (57.5mm) diameter core. Core recoveries were excellent and average close to 100% in fresh rock. After photographing and logging in Mawson’s Rovaniemi facilities, core intervals averaging 1 metre for mineralized samples and 2 metres for barren samples were cut in half at the Geological Survey of Finland (GTK) core facilities in Rovaniemi, Finland. The remaining half core is retained for verification and reference purposes. Analytical samples were transported by Mawson personnel or commercial transport from site to the CRS Minlab Oy facility in Kempele, Finland. Samples were prepared and analyzed for gold at Kempele using the PAL1000 technique which involves grinding the sample in steel pots with abrasive media in the presence of cyanide, followed by measuring the gold in solution with flame AAS equipment. The QA/QC program of Mawson consists of the systematic insertion of certified standards of known gold content, duplicate samples by quartering the core, and blanks the within interpreted mineralized rock. In addition, CRS inserts blanks and standards into the analytical process. 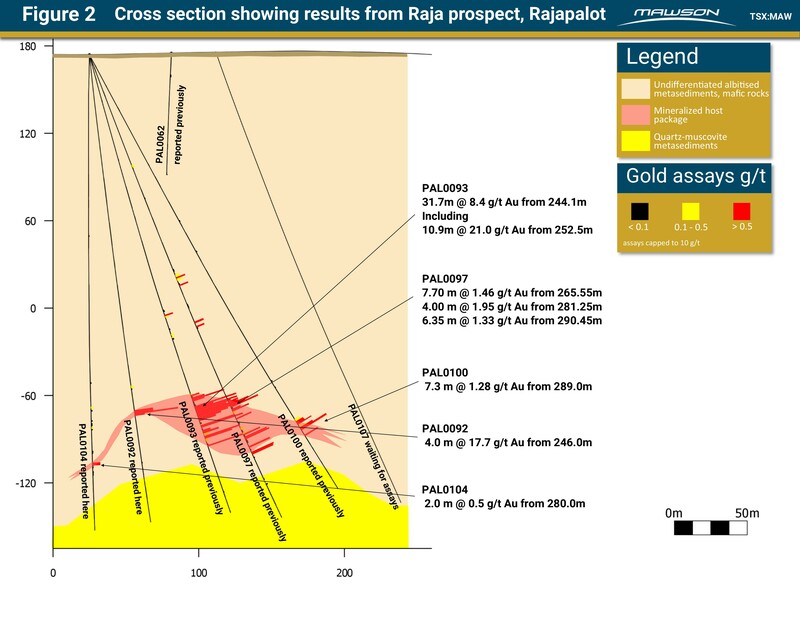 Intersections are reported with a lower cut of 0.5g/t gold over 2 metre lower cut, except where indicated by **. No upper cut-off was applied.